"He brings so much joy, literally, to everybody, I couldn't keep him all to myself," said his guardian angel, Alisha Tomlinson, who sends "a subtle message of vegetarianism," according to The Charlotte Observer, Charlotte, North Carolina, May 27, 2008. 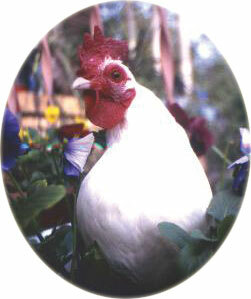 I am sad to report that Mr. Henry Joy, gentleman rooster, therapy chicken and beloved friend, passed away peacefully on January 8, 2009. In his 9 years of life, Mr. Joy touched many lives, proving that when it comes to love, neither size nor species is important. Mr. Joy had a special knack for making people smile. He loved riding in his tiny basket, meeting people all over North Carolina at charity fundraisers, art galleries and pet parades. He reached a worldwide audience through his website www.mrjoy.net. Fans as far away as New Zealand appreciated his special charm and message of animal sentience. Mr. Joy helped enlighten folks about the plight of chickens raised on factory farms, but he may be most well known for his work as a therapy rooster. Mr. Joy visited nursing homes and assisted living centers locally, bringing smiles and laughter to many elderly and disabled residents. His therapy work gained nationwide attention through television, radio and newspaper stories, allowing him to reach an ever wider audience. To watch Mr. Joy visiting the Golden Living Center on the Internet, go to www.mrjoy.net/dayinthelife.html.